As concerns Directive 80/720/EEC, it is appropriate to clarify which windows may be designated as emergency exits. As concerns Directive 86/415/EEC, in order to improve safety of tractors it is suitable to specify safety requirements for the external controls of the power take-off. As concerns Directive 86/415/EEC, the use of pictorials according to standards ISO 3767-1:1996 and ISO 3767-2:1996 as symbols for the controls should be allowed in order to adapt Community standards to the standards applied in the framework of controls of wheeled agricultural or forestry tractors worldwide. As concerns Directive 2000/25/EC, certain additional indications need to be specified in order to be consistent with the introduction of new stage limits (IIIA, IIIB and IV), introduced by Commission Directive 2005/13/EC (7). As concerns Directive 2003/37/EC, a more precise wording for some points in the information documents should be included for reasons of clarity. As concerns Directives 2003/37/EC, 86/298/EEC and 87/402/EEC, in view of the fact that OECD Decision C(2005) 1 of the OECD Council was most recently amended by Decision C(2008) 128 of October 2008, it is appropriate to update the references to the OECD codes. For reasons of legal certainty it is necessary to include the relevant texts of such OECD documents in the Directives. Directives, 80/720/EEC, 86/298/EEC, 86/415/EEC, 87/402/EEC, 2000/25/EC and 2003/37/EC should be amended accordingly. Directive 80/720/EEC is amended in accordance with Annex I to this Directive. Directive 86/298/EEC is amended in accordance with Annex II to this Directive. Directive 86/415/EEC is amended in accordance with Annex III to this Directive. Directive 87/402/EEC is amended in accordance with Annex IV to this Directive. Directive 2000/25/EC is amended in accordance with Annex V to this Directive. Annexes I and II are amended in accordance with Annex VI to this Directive. 1. Member States shall adopt and publish, by 30 April 2011 at the latest, the laws, regulations and administrative provisions necessary to comply with this Directive. They shall forthwith communicate to the Commission the texts of those provisions. They shall apply those provisions from 1 May 2011, with the exception of Article 5 which they shall apply from the date of entry into force of this Directive. Done at Brussels, 15 March 2010. (1) OJ L 194, 28.7.1980, p. 1. (2) OJ L 186, 8.7.1986, p. 26. (3) OJ L 240, 26.8.1986, p. 1. (4) OJ L 220, 8.8.1987, p. 1. (5) OJ L 173, 12.7.2000, p. 1. (6) OJ L 171, 9.7.2003, p. 1. (7) OJ L 55, 1.3.2005, p. 35. ‘Any window of sufficient size may be designated as an emergency exit if they are made of breakable glass and can be broken with a tool provided in the cab for that purpose. Glass referred to in Appendices 3, 4, 5, 6 and 7 of Annex III B to Council Directive 89/173/EEC (1) is not considered to be breakable glass for the purpose of this Directive. Roll-over protective structure (safety cab or frame), hereinafter called ‘protective structure’, means the structure on a tractor the essential purpose of which is to avoid or limit risks to the driver resulting from roll-over of the tractor during normal use. 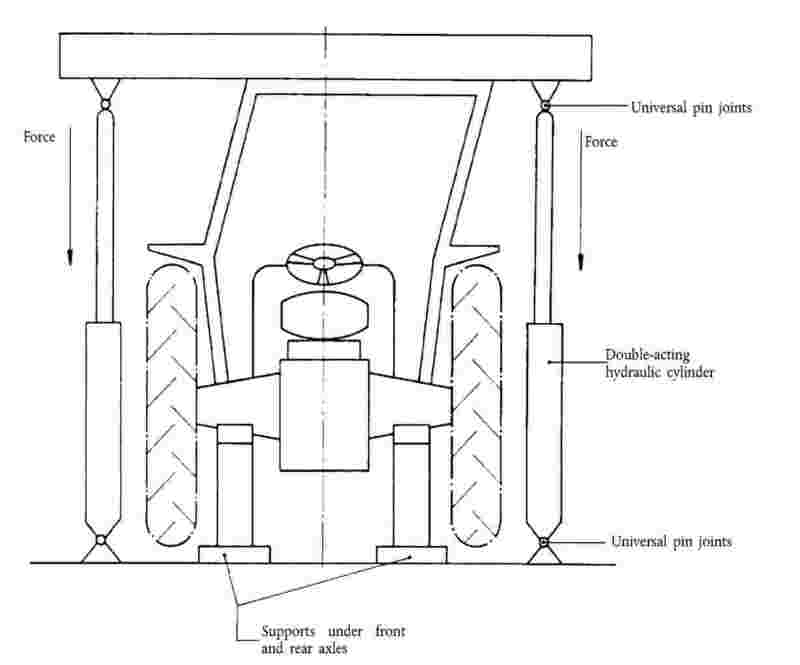 The roll-over protective structure is characterized by the provision of space for a clearance zone large enough to protect the driver when seated either inside the envelope of the structure or within a space bounded by a series of straight lines from the outer edges of the structure to any part of the tractor that might come into contact with flat ground and that is capable of supporting the tractor in that position if the tractor overturns. The median plane of the wheel is equidistant from the two planes containing the periphery of the rims at their outer edges. The vertical plane through the wheel axis intersects its median plane along a straight line which meets the supporting surface at one point. 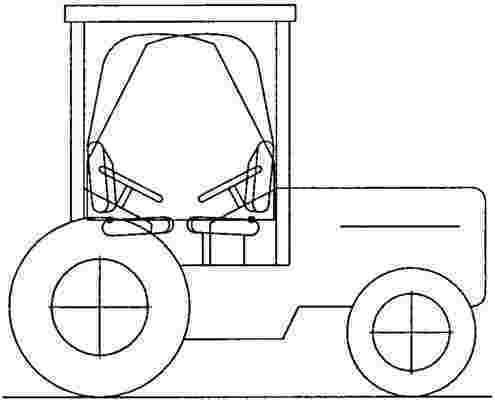 If A and B are the two points thus defined for the wheels on the same axle of the tractor, then the track width is the distance between points A and B. The track may be thus defined for both front and rear wheels. Where there are twin wheels, the track is the distance between two planes each being the median plane of the pairs of wheels. Take the extreme positions of points A and B for the tractor rear axle, which gives the maximum possible value for the track. The vertical plane at right angles to the line AB at its centre point is the median plane of the tractor. The distance between the vertical planes passing through the two lines AB as defined above, one for the front wheels and one for the rear-wheels. where the position of the seat is adjustable only lengthwise and vertically, the longitudinal axis passing through the seat index point shall be parallel with the vertical longitudinal plane of the tractor passing through the centre of the steering wheel and not more than 100 mm from that plane. The clearance zone is illustrated in Figures 7.1 and 7.2. The zone is defined in relation to the reference plane and the seat index point (SIP). The reference plane is a vertical plane, generally longitudinal to the tractor and passing through the seat index point and the centre of the steering wheel. Normally the reference plane coincides with the longitudinal median plane of the tractor. This reference plane shall be assumed to move horizontally with the seat and steering wheel during loading but to remain perpendicular to the tractor or the floor of the roll-over protective structure. The clearance zone shall be defined on the basis of sub clauses 1.6.2 and 1.6.3.
two portions I1 Q1 M1 L1 and I2 Q2 M2 L2 of the horizontal plane passing 300 mm above the plane defined in 1.6.2.7 above. For tractors with a reversible driver’s position (reversible seat and steering wheel), the zone of clearance is the envelope of the two clearance zones defined by the two different positions of the steering wheel and the seat. In case of tractors that could be fitted with optional seats, the envelope comprising the seat index points of all options offered shall be used during the tests. The protective structure shall not enter the larger clearance zone which takes account of these different seat index points. In the case where a new seat option is offered after the test has been performed, a determination shall be made to see whether the clearance zone around the new SIP falls within the envelope previously established. If it does not, a new test must be performed. Tests made using special rigs are intended to simulate such loads as are imposed on a protective structure, when the tractor overturns. These tests enable observations to be made on the strength of the protective structure and any brackets attaching it to the tractor and any parts of the tractor which transmit the test load. Tests may be performed in accordance with the dynamic procedure or the static procedure. The two methods are deemed equivalent. The protective structure must conform to the series production specifications. It shall be attached in accordance with the manufacturer’s recommended method to one of the tractors for which it is designed. Note: A complete tractor is not required for the static strength test; however, the protective structure and parts of the tractor to which it is attached represent an operating installation, hereinafter referred to as ‘the assembly’. For both the static test and the dynamic test the tractor as assembled (or the assembly) must be fitted with all series production components which may affect the strength of the protective structure or which may be necessary for the strength test. Components which may create a hazard in the clearance zone must also be fitted on the tractor (or the assembly) so that they may be examined to see whether the requirements of the Acceptance Conditions in 3.1.3 have been fulfilled. All components of the tractor or the protective structure including weather protective must be supplied or described on drawings. For the strength tests, all panels and detachable non-structural components must be removed so that they may not contribute to the strengthening of the protective structure. The track width must be adjusted so that the protective structure will, as far as possible, not be supported by the tyres during the strength tests. If these tests are conducted in accordance with the static procedure, the wheels may be removed. The reference mass M, used in the formulae to calculate the height of the fall of the pendulum block, the loading energies and the crushing forces, must be at least the mass of the tractor, excluding optional accessories but including coolant, oils, fuel, tools plus the protective structure. Not included are optional front or rear weights, tyre ballast, mounted implements, mounted equipment or any specialised components. crushing at the front of the structure (dynamic or static test) (see 3.2.1.1.5 and 3.2.2.1.5). If, during the test, any part of the tractor restraining equipment breaks or moves, the test shall be restarted. No repairs or adjustments of the tractor or protective structure may be carried out during the tests. The tractor gear box shall be in neutral and the brakes off during the tests. 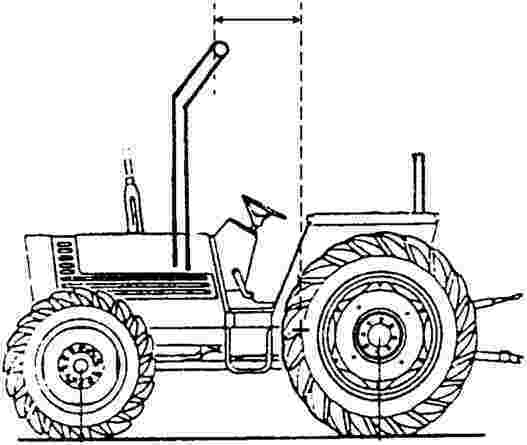 If the tractor is fitted with a suspension system between the tractor body and the wheels, it shall be blocked during the tests. The side chosen for application of the first impact (dynamic test) or the first load (static test) on the rear of the structure shall be that which, in the opinion of the testing authorities, will result in the application of the series of impacts or loads under the most unfavourable conditions for the structure. The lateral impact or load and the rear impact or load shall be applied on both sides of the longitudinal median plane of the protective structure. The front impact or load shall be applied on the same side of the longitudinal median plane of the protective structure as the lateral impact or load. the elastic deflection, measured in accordance with 3.2.1.2.3 and 3.2.2.2.3 shall be less than 250 mm. There shall be no accessories presenting a hazard for the driver. There shall be no projecting part or accessory which is liable to injure the driver should the tractor overturn, or any accessory or part which is liable to trap him – for example by the leg or the foot – as a result of the deflections of the structure. A block acting as a pendulum must be suspended by two chains or wire ropes from pivot points not less than 6 m above the ground. Means must be provided for adjusting independently the suspended height of the block and the angle between the block and the supporting chains or wire ropes. The mass of the pendulum block must be 2 000 ± 20 kg excluding the mass of the chains or wire ropes which themselves must not exceed 100 kg. The length of the sides of the impact face must be 680 ± 20 mm (see Figure 7.3). The block must be filled in such a way that the position of its centre of gravity is constant and coincides with the geometrical centre of the parallelepiped. The parallelepiped must be connected to the system which pulls it backwards by an instantaneous release mechanism which is so designed and located as to enable the pendulum block to be released without causing the parallelepiped to oscillate about its horizontal axis perpendicular to the pendulum’s plane of oscillation. The pendulum pivot points must be rigidly fixed so that their displacement in any direction does not exceed 1 per cent of the height of fall. 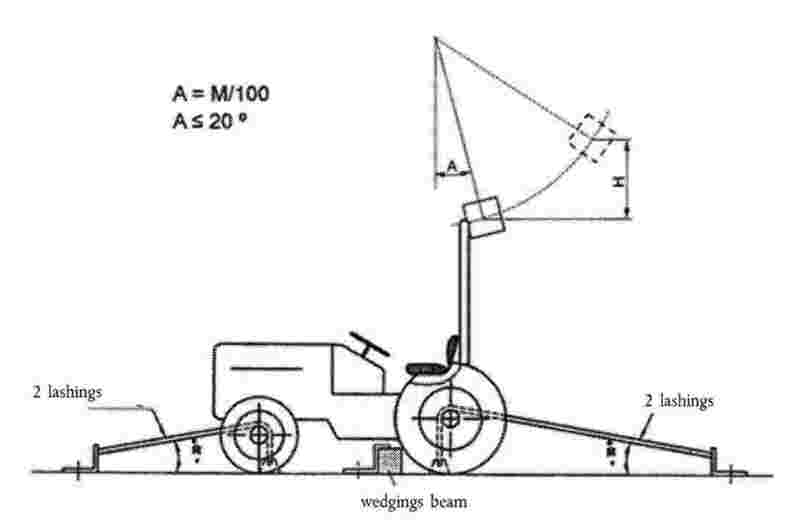 Anchoring rails with the requisite track width and covering the necessary area for lashing the tractor in all the cases illustrated (see Figures 7.4, 7.5 and 7.6) must be rigidly attached to a non-yielding base beneath the pendulum. The tractor shall be lashed to the rails by means of wire rope with round strand, fibre core, construction 6 × 19 in accordance with ISO 2408:2004 and a nominal diameter of 13 mm. The metal strands must have an ultimate tensile strength of 1 770 MPa. 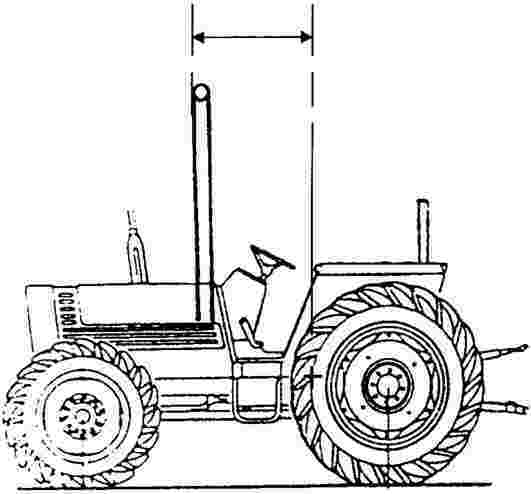 The central pivot of an articulated tractor shall be supported and lashed down as appropriate for all tests. For the lateral impact test, the pivot shall also be propped from the side opposite the impact. The front and rear wheels need not be in line if this facilitates the attachment of the wire ropes in the appropriate manner. A softwood beam of 150 mm square shall be used as a prop for the wheels during the impact tests (see Figures 7.4, 7.5 and 7.6). 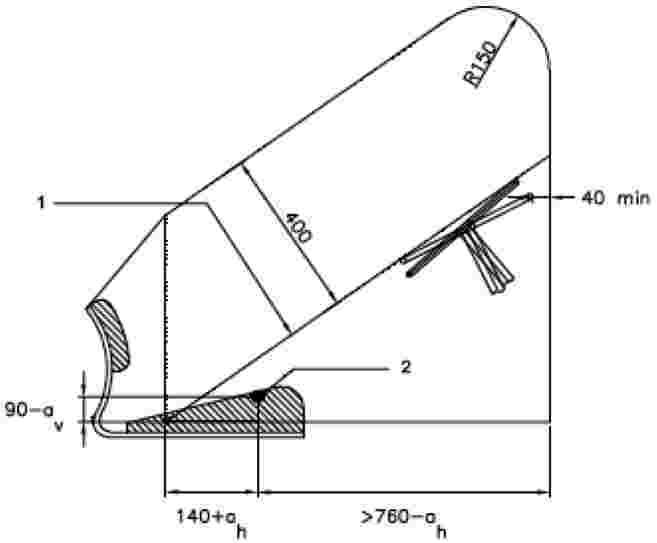 During the lateral impact tests, a softwood beam shall be clamped to the floor to brace the rim of the wheel opposite the side of impact (see Figure 7.6). Additional props and lashings must be used for articulated tractors. Their purpose is to ensure that the section of the tractor on which the protective structure is fitted is as rigid as that of a non-articulated tractor. Additional specific details are given in section 3.2.1.1 for the impact and crushing tests. The tractor tyres shall not be liquid-ballasted and shall be inflated to the pressures prescribed by the tractor manufacturer for field work. The lashings shall be tensioned in each particular case such that the tyres undergo a deflection equal to 12 per cent of the tyre wall height (distance between the ground and the lowest point of the rim) before tensioning. 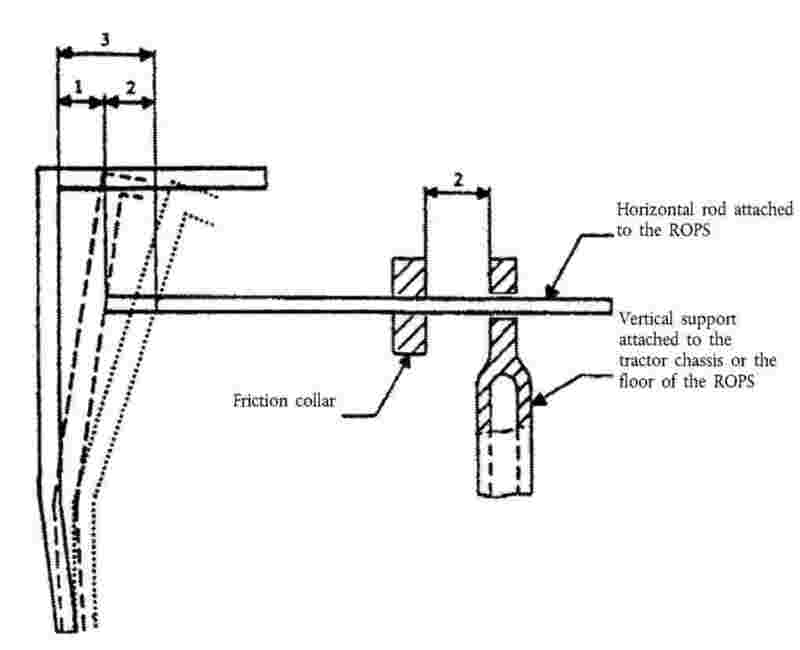 A rig as shown in Figure 7.7 shall be capable of exerting a downward force on a protective structure through a rigid beam approximately 250 mm wide connected to the load-applying mechanism by means of universal joints. Suitable axle stands shall be provided so that the tractor tyres do not bear the crushing force. device for measuring the elastic deflection (the difference between the maximum momentary deflection and the permanent deflection, see Figure 7.8). device for checking that the protective structure has not entered the clearance zone and that the latter has remained within the structure’s protective during the test (see section 3.2.2.2.2). The static testing rig must be designed in such a way as to permit thrusts or loads to be applied to the protective structure. Provision must be made so that the load can be uniformly distributed normal to the direction of loading and along a flange having a length of one of the exact multiples of 50 between 250 and 700 mm. The stiff beam shall have a vertical face dimension of 150 mm. The edges of the beam in contact with the protective structure shall be curved with a maximum radius of 50 mm. The pad shall be capable of being adjusted to any angle in relation to the load direction, in order to be able to follow the angular variations of the structure’s load-bearing surface as the structure deflects. during test, under load: 10° above and 20° below the horizontal. These variations must be kept to a minimum. The deflection rate shall be sufficiently slow, less than 5 mm/s so that the load may at all moments be considered as static. 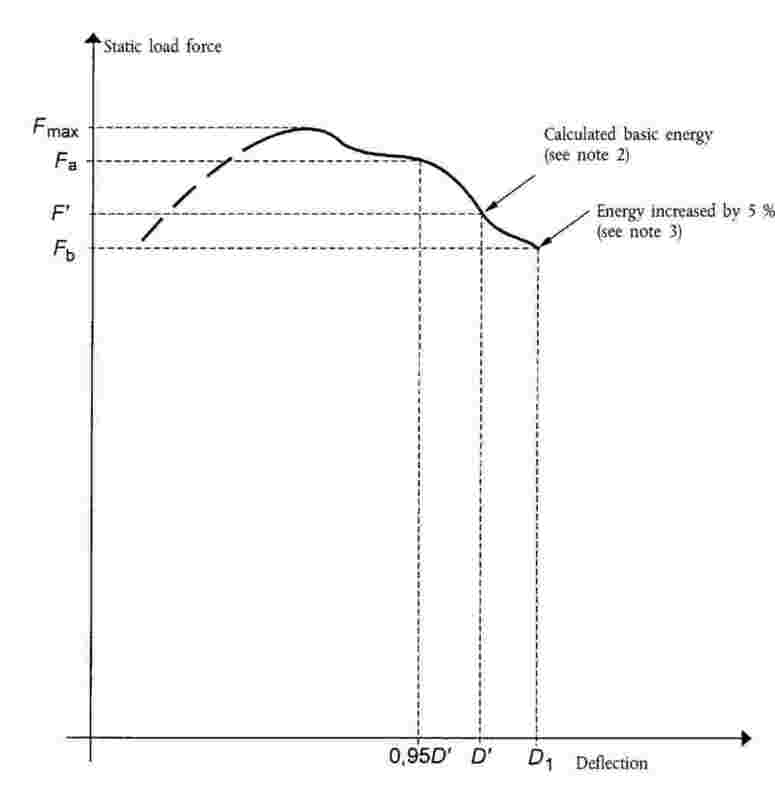 The force versus deflection curve shall be plotted in order to determine the energy absorbed by the structure. 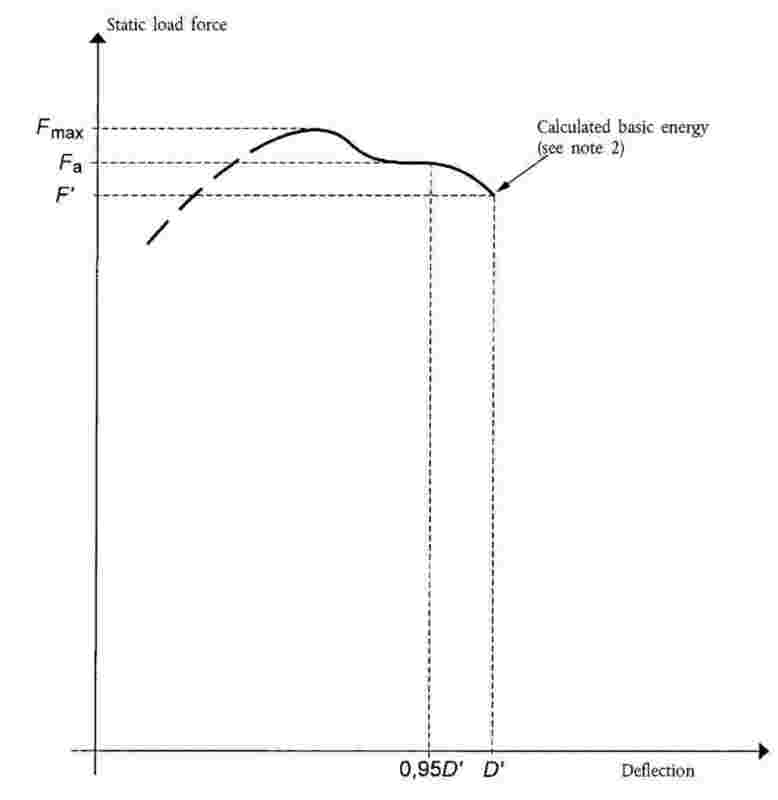 There is no need to measure the force and deflection at the point where the load is applied to the structure; however, force and deflection shall be measured simultaneously and co-linearly. The point of origin of deflection measurements shall be selected so as to take account only of the energy absorbed by the structure and/or by the deflection of certain parts of the tractor. The energy absorbed by the deflection and/or the slipping of the anchoring must be ignored. Anchoring rails with the requisite track width and covering the necessary area for anchoring the tractor in all the cases illustrated must be rigidly attached to a non-yielding base near the testing rig. The tractor must be anchored to the rails by any suitable means (plates, wedges, wire ropes, jacks, etc.) so that it cannot move during the tests. This requirement shall be checked during the test, by means of the usual devices for measuring length. 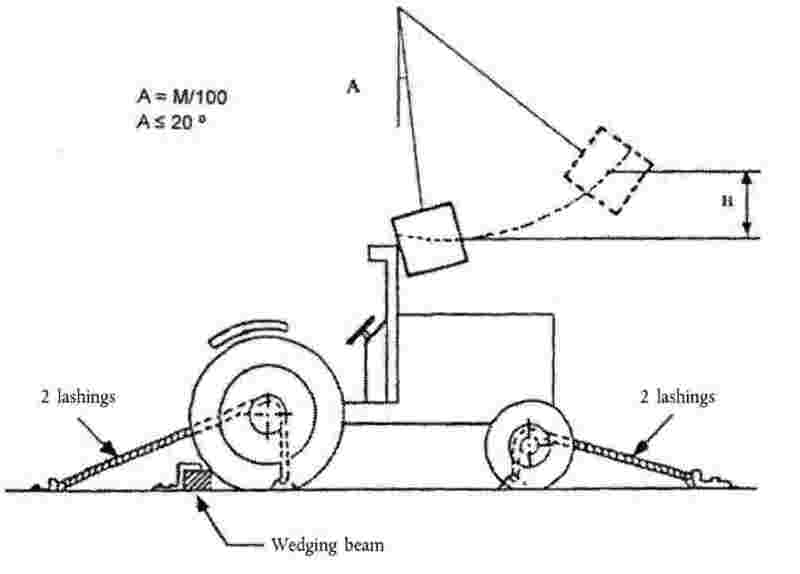 If the tractor moves, the entire test shall be repeated, unless the system for measuring the deflections taken into account for plotting the force versus deflection curve is connected to the tractor. 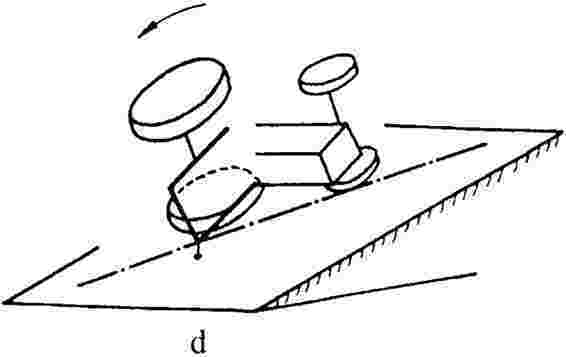 A rig as shown in Figure 7.7 shall be capable of exerting a downward force on a protective structure through a rigid beam approximately 250 mm wide, connected to the load-applying mechanism by means of universal joints. Suitable axle stands must be provided so that the tractor tyres do not bear the crushing force. device for checking that the protective structure has not entered the clearance zone and that the latter has remained within the structure’s protective during the test (section 3.3.2.2.2). The tractor shall be so placed in relation to the pendulum block that the block will strike the protective structure when the impact face of the block and the supporting chains or wire ropes are at an angle with the vertical plane A equal to M/100 with a 20° maximum, unless, during deflection, the protective structure at the point of contact forms a greater angle to the vertical. 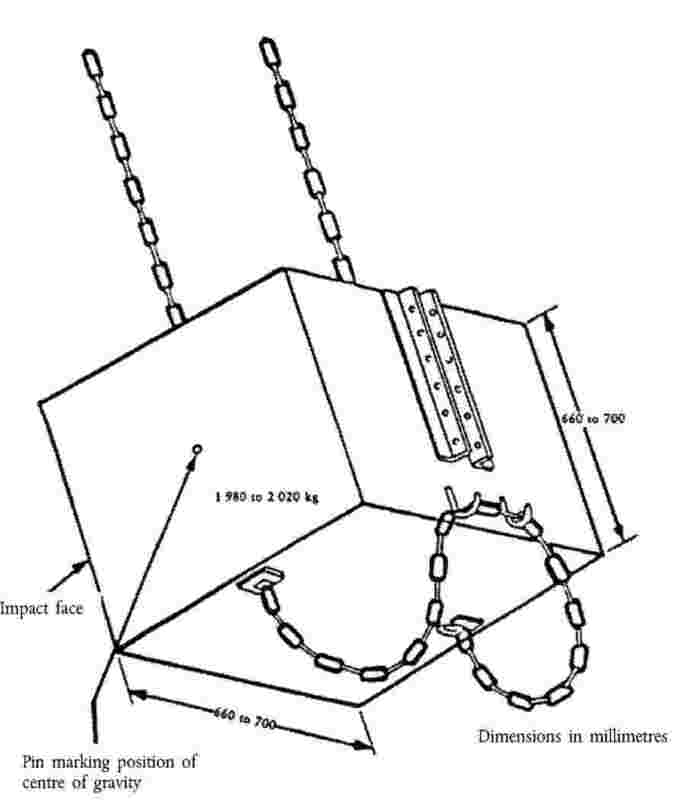 In this case the impact face of the block shall be adjusted by means of an additional support so that it is parallel to the protective structure at the point of impact at the moment of maximum deflection, the supporting chains or wire ropes remaining at the angle defined above. The suspended height of the block shall be adjusted and necessary steps taken so as to prevent the block from turning about the point of impact. The point of impact is that part of the protective structure likely to hit the ground first in a rearward overturning accident, normally the upper edge. The position of the centre of gravity of the block is 1/6 of the width of the top of the protective structure inwards from a vertical plan parallel to the median plane of the tractor touching the outside extremity of the top of the protective structure. If the structure is curved or protruding at this point, wedges enabling the impact to be applied thereon must be added, without thereby reinforcing the structure. The tractor must be lashed to the ground by means of four wire ropes, one at each end of both axles, arranged as indicated in Figure 7.4. The spacing between the front and rear lashing points must be such that the wire ropes make an angle of less than 30° with the ground. The rear lashings must in addition be so arranged that the point of convergence of the two wire ropes is located in the vertical plane in which the centre of gravity of the pendulum block travels. The wire ropes must be tensioned so that the tyres undergo the deflections given in 3.1.5.6.2. With the wire ropes tensioned, the wedging beam shall be placed in front of and tight against the rear wheels and then fixed to the ground. If the tractor is of the articulated type, the point of articulation shall, in addition, be supported by a wooden block at least 100 mm square and firmly lashed to the ground. The pendulum block is then released and strikes the protective structure. for tractor with a reference mass of more than 2 000 kg. The suspended height of the pendulum block shall be adjusted and the necessary steps taken so as to prevent the block from turning about the point of impact. The point of impact is that part of the protective structure likely to hit the ground first if the tractor overturned sideways while travelling forward, normally the upper edge. The position of the centre of gravity of the block is 1/6 of the width of the top of the protective structure inwards from a vertical plane parallel to the median plane of the tractor touching the outside extremity of the top of the protective structure. The tractor must be lashed to the ground by means of four wire ropes, one at each end of both axles, arranged as indicated in Figure 7.5. The spacing between the front and rear lashing points must be such that the wire ropes make an angle of less than 30° with the ground. The rear lashings must in addition be so arranged that the point of convergence of the two wire ropes is located in the vertical plane in which the centre of gravity of the pendulum block travels. The wire ropes must be tensioned so that the tyres undergo the deflections given in 3.1.5.6.2. With the wire ropes tensioned, the wedging beam shall be placed behind and tight against the rear wheels and then fixed to the ground. The tractor shall be so placed in relation to the pendulum block that the block will strike the protective structure when the impact face of the block and the supporting chains or wire ropes are vertical unless, during deflection, the protective structure at the point of contact forms an angle of less than 20° to the vertical. 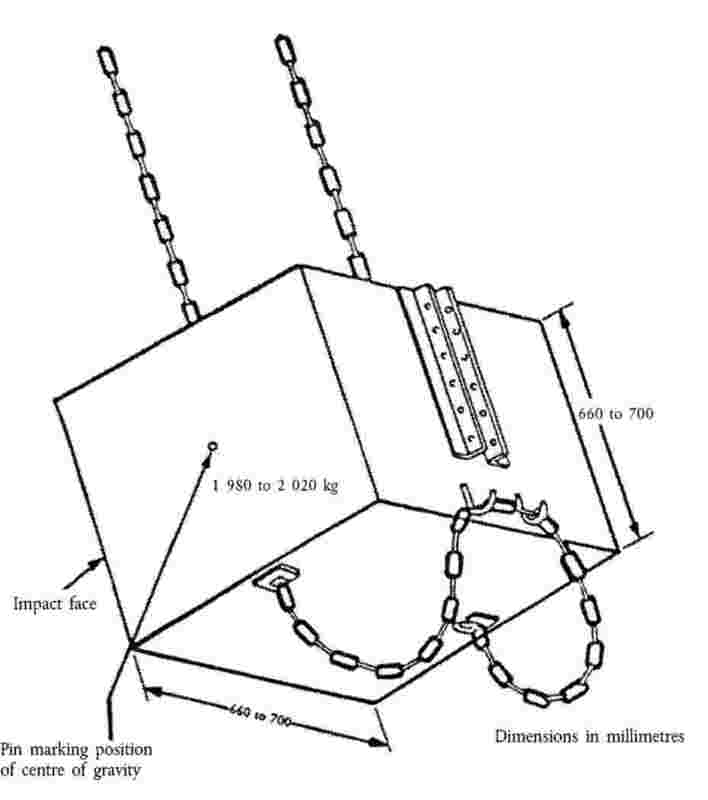 In this case the impact face of the block shall be adjusted by means of an additional support so that it is parallel to the protective structure at the point of impact at the moment of maximum deflection, the supporting chains or wire ropes remaining vertical on impact. The suspended height of the pendulum block shall be adjusted and necessary steps taken so as to prevent the block from turning about the point of impact. The point of impact shall be that part of the protective structure likely to hit the ground first in a sideways overturning accident, normally the upper edge. Unless it is certain that another part of this edge would hit ground first, the point of impact shall be in the plane at right angles to the median plane and passing 60 mm in front of the seat index point, the seat being set at the mid-position of longitudinal adjustment. 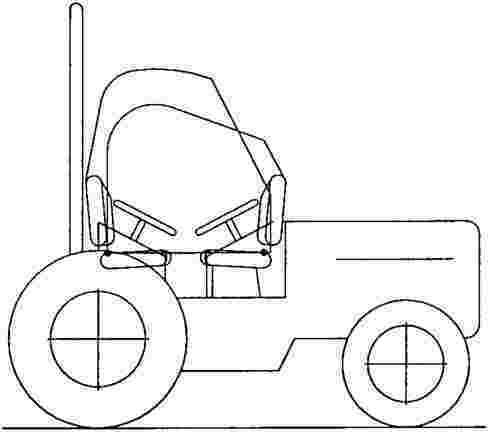 For tractors with a reversible driver’s position (reversible seat and steering wheel), the point of impact shall be in the plane at right angles to the median plane and passing at the midpoint of the segment joining the two seat index points defined by joining the two different positions of the seat. For protective structures having a two-post system, the impact shall be located on one of the two posts. The tractor wheels on the side which is to receive the impact must be lashed to the ground by means of wire ropes passing over the corresponding ends of the front and rear axles. The wire ropes must be tensioned to produce the tyre deflection values given in 3.1.5.6.2. With the wire ropes tensioned, the wedging beam shall be placed on the ground, pushed tight against the tyres on the side opposite that which is to receive the impact and then fixed to the ground. It may be necessary to use two beams or wedges if the outer sides of the front and rear tyres are not in the same vertical plane. The prop shall then be placed as indicated in Figure 7.6 against the rim of the most heavily loaded wheel opposite to the point of impact, pushed firmly against the rim and then fixed at its base. The length of the prop shall be such that it makes an angle of 30 ± 3° with the ground when in position against the rim. In addition, its thickness shall, if possible, be between 20 and 25 times less than its length and between 2 and 3 times less than its width. The props shall be shaped at both ends as shown in the details on Figure 7.6. If the tractor is of the articulated type, the point of articulation shall in addition be supported by a wooden block at least 100 mm square and laterally supported by a device similar to the prop pushed against the rear wheel as in 3.2.1.1.3.2. The point of articulation shall then be lashed firmly to the ground. for tractors with a reference mass of more than 2 000 kg. The force Fv shall be maintained for five seconds after the cessation of any visually detectable movement of the protective structure. Where the rear part of the protective structure roof will not sustain the full crushing force, the force shall be applied until the roof is deflected to coincide with the plane joining the upper part of the protective structure with that part of the rear of the tractor capable of supporting the tractor when overturned. The force shall then be removed, and the crushing beam repositioned over that part of the protective structure which would support the tractor when completely overturned. The crushing force Fv shall then be applied again. Where the front part of the protective structure roof will not sustain the full crushing force, the force shall be applied until the roof is deflected to coincide with the plane joining the upper part of the protective structure with that part of the front of the tractor capable of supporting the tractor when overturned. In order to be able to carry out the additional test, it is necessary to measure the elastic deformation during all the impact tests. If during a crushing test, significant cracks or tears appear, a second, similar, crushing test, but with a force equal to 1,2 Fv shall be performed immediately after the crushing tests which caused these tears or cracks to appear. After each test all structural members, joints and fastening systems shall be visually examined for fractures or cracks, any small cracks in unimportant parts being ignored. Any tears caused by the edges of the pendulum weight are to be ignored. During each test the protective structure shall be examined to see whether any part it has entered a clearance zone round the driving seat as defined in 1.6. Furthermore, the clearance zone shall not be outside the protection of the protective structure. For this purpose, it shall be considered to be outside the protection of the structure if any part of it would come in contact with flat ground if the tractor overturned towards the direction from which the test load is applied. For estimating this, the front and rear tyres and track width setting shall be the smallest standard fitting specified by the manufacturer. The elastic deflection shall be measured (810 + av) mm above the seat index point, in the vertical plane in which the load is applied. For this measurement, any apparatus similar to that illustrated in Figure 7.8 may be used. After the final crushing test, the permanent deflection of the protective structure shall be recorded. For this purpose, before the start of the test, the position of the main roll-over protective structure members in relation to the seat index point shall be used. The load shall be applied horizontally, in a vertical plane parallel to the tractor’s median plane. The load application point shall be that part of the roll-over protective structure likely to hit the ground first in a rearward overturning accident, normally the upper edge. The vertical plane in which the load is applied shall be located at a distance of one third of the external width of the upper part of the structure from the median plane. If the structure is curved or protruding at this point, wedges enabling the load to be applied thereon shall be added, without thereby reinforcing the structure. The assembly shall be lashed to the ground as described in 3.1.6.3. The load shall be applied horizontally in a vertical plane parallel to the tractor’s median plane. The point of application shall be that part of the protective structure likely to hit the ground first if the tractor overturns sideways while travelling forward, i.e. normally the upper edge. The point of application of the load shall be 1/6 of the width of the top of the protective structure inwards from a vertical plane parallel to the median plane of the tractor touching the outside extremity of the top of the protective structure. The side loading shall be applied horizontally, in a vertical plane perpendicular to the tractor’s median plane passing 60 mm in front of the seat index point, the seat being at the mid-position of the longitudinal adjustment. The load application point shall be that part of the roll-over protective structure likely to hit the ground first in a sideways overturning accident, normally the upper edge. 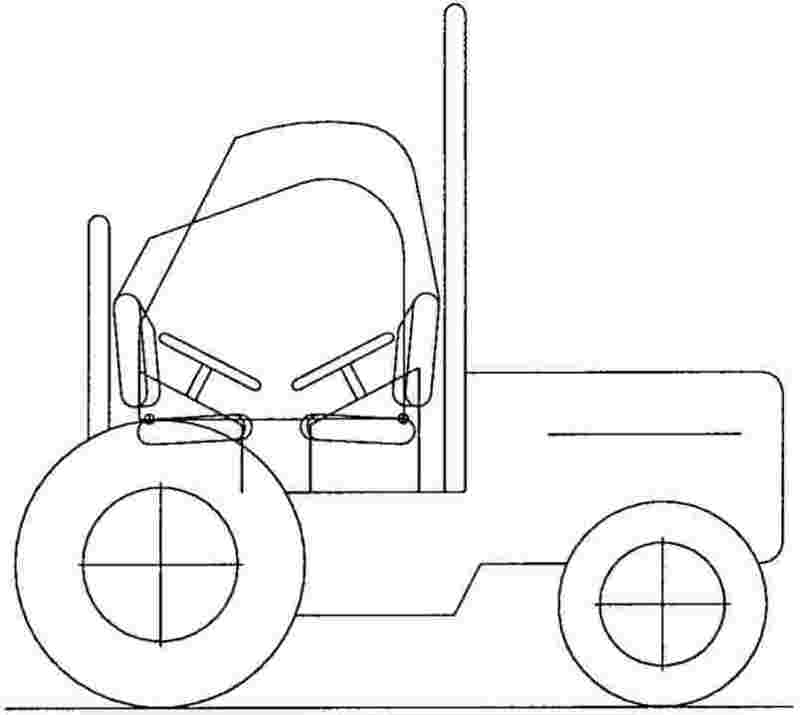 For tractors with a reversible driver’s position (reversible seat and steering wheel), the load application point shall be in the plane at right angles to the median plane and passing at the midpoint of the segment joining the two seat index points defined by joining the two different positions of the seat. For protective structures having a two-post system, the load shall be located on one of the two posts. All provisions are identical to those given in 3.2.1.1.4. All provisions are identical to those given in 3.2.1.1.5. An overload test shall be carried out in all cases where the force decreases by more than 3 per cent during the last 5 per cent of the deflection reached when the energy required is absorbed by the structure (see Figure 7.10). 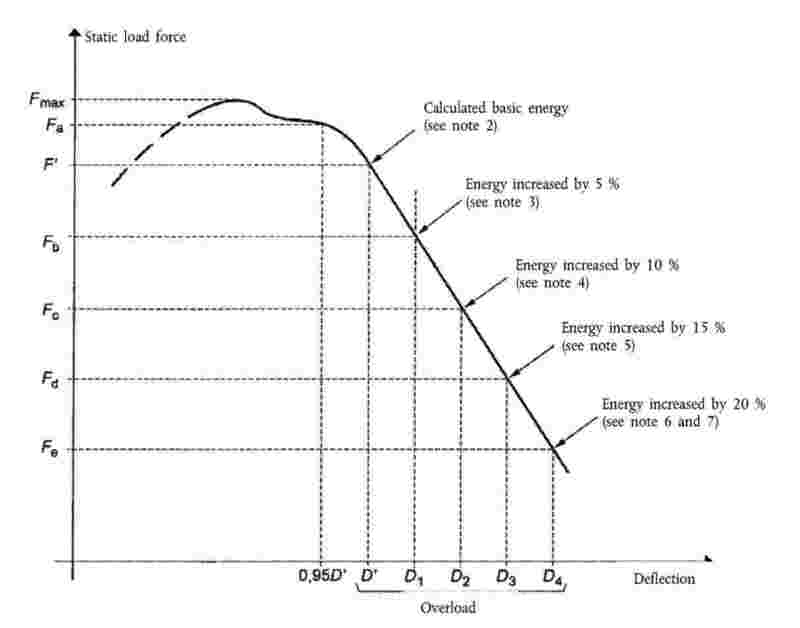 The overload test involves the gradual increase of the horizontal load by increments of 5 per cent of the initial energy requirement up to a maximum of 20 per cent of energy added (see Figure 7.11). The overload test is satisfactory if, after each increase by 5, 10, or 15 per cent in the energy required, the force decreases by less than 3 per cent for a 5 per cent increment and remains greater than 0,8 Fmax. The overload test is satisfactory if, after the structure has absorbed 20 per cent of the added energy, the force exceeds 0,8 Fmax. Additional cracks or tears and/or entry into or lack of protective of the clearance zone due to elastic deflection are permitted during the overload test. However, after the removal of the load, the structure shall not enter the clearance zone, which shall be completely protected. If cracks or tears which cannot be considered as negligible appear during a crushing test, a second, similar crushing, but with a force of 1,2 Fv shall be applied immediately after the crushing test which caused the cracks or tears to appear. After each test all structural members, joints and attachment systems shall be visually examined for fractures or cracks, any small cracks in unimportant parts being ignored. During each test the protective structure shall be examined to see whether any part of it has entered a clearance zone as defined in 1.6 of Annex I. In addition, an examination shall be made to determine whether any part of the clearance zone is outside the protection of the structure. For this purpose it is considered to be outside the protection of the roll-over protective structure if any part of it would have come in contact with the ground plane if the tractor had overturned in the direction from which the impact came. For this purpose the front and rear tyres and track setting are assumed to be the smallest specified by the manufacturer. The impact and crushing tests need not be carried out on each model of tractor, provided that the protective structure and tractor comply with the conditions referred to hereunder 3.3.2.1.1 to 3.3.2.1.5. The structure shall be identical to the one tested. The required energy shall not exceed the energy calculated for the original test by more than 5 per cent. The method of attachment and the tractor components to which the attachment is made shall be identical. Any components such as mudguards and bonnet that may provide support for the protective structure shall be identical. The position and critical dimensions of the seat in the protective structure and the relative position of the protective structure on the tractor shall be such that the clearance zone would have remained within the protection of the deflected structure throughout all tests (this shall be checked by using the same reference of clearance zone as in the original test report, respectively Seat Reference Point [SRP] or Seat Index Point [SIP]). Modifications having no impact on the results of the initial test (e.g. weld attachment of the mounting plate of an accessory in a non-critical location on the structure), addition of seats with different SIP location in the protective structure (subject to checking that the new clearance zone(s) remain(s) within the protection of the deflected structure throughout all tests). Modifications having a possible impact on the results of the original test without calling into question the acceptability of the protective structure (e.g. modification of a structural component, modification of the method of attachment of the protective structure to the tractor). A validation test can be carried out and the test results will be drafted in the extension report. if the force measured when the required energy level has been reached in the various horizontal load tests does not deviate from the force measured when the required energy has been reached in the original test by more than ± 7 % and the deflection measured (4) when the required energy level has been reached in the various horizontal load tests does not deviate from the deflection measured when the required energy has been reached in the original test by more than ± 7 % (in case of a static test). more than one protective structure modifications may be included in a single extension report if they represent different options of the same protective structure, but only one validation test can be accepted in a single extension report. The options not tested shall be described in a specific section of the extension report. Increase of the reference mass declared by the manufacturer for a protective structure already tested. If the manufacturer wants to keep the same approval number it is possible to issue an extension report after having carried out a validation test (the limits of ± 7 % specified in 3.3.2.2.2.2 are not applicable in such a case). If the protective structure is claimed to have properties resistant to cold weather embrittlement, the manufacturer shall give details that shall be included in the report. The following requirements and procedures are intended to provide strength and resistance to brittle fracture at reduced temperatures. It is suggested that the following minimum material requirements shall be met in judging the protective structure’s suitability at reduced operating temperatures in those countries requiring this additional operating protection. Bolts and Nuts used to attach the protective structure to the tractor and used to connect structural parts of the protective structure shall exhibit suitable controlled reduced temperature toughness properties. All welding electrodes used in the fabrication of structural members and mounts shall be compatible with the protective structure material as given in 3.5.2.3 below. Steel materials for structural members of the protective structure shall be of controlled toughness material exhibiting minimum Charpy V-Notch impact energy requirements as shown in Table 7.1. Steel grade and quality shall be specified in accordance with ISO 630:1995. Steel with an as-rolled thickness less than 2,5 mm and with a carbon content less than 0,2 per cent is considered to meet this requirement. Structural members of the protective structure made from materials other than steel shall have equivalent low temperature impact resistance. When testing the Charpy V-Notch impact energy requirements, the specimen size shall be no less than the largest of the sizes stated in Table 7.1 that the material will permit. The Charpy V-Notch tests shall be made in accordance with the procedure in ASTM A 370-1979, except for specimen sizes that shall be in accordance with the dimensions given in Table 7.1. Alternatives to this procedure are the use of killed or semi-killed steel for which an adequate specification shall be provided. Steel grade and quality shall be specified in accordance with ISO 630:1995, Amd 1:2003. Specimens are to be longitudinal and taken from flat stock, tubular or structural sections before forming or welding for use in the protective structure. Specimens from tubular or structural sections are to be taken from the middle of the side of greatest dimension and shall not include welds. (1) OECD standard code for the official testing of rear-mounted roll-over protective structures on narrow-track wheeled agricultural and forestry tractors. 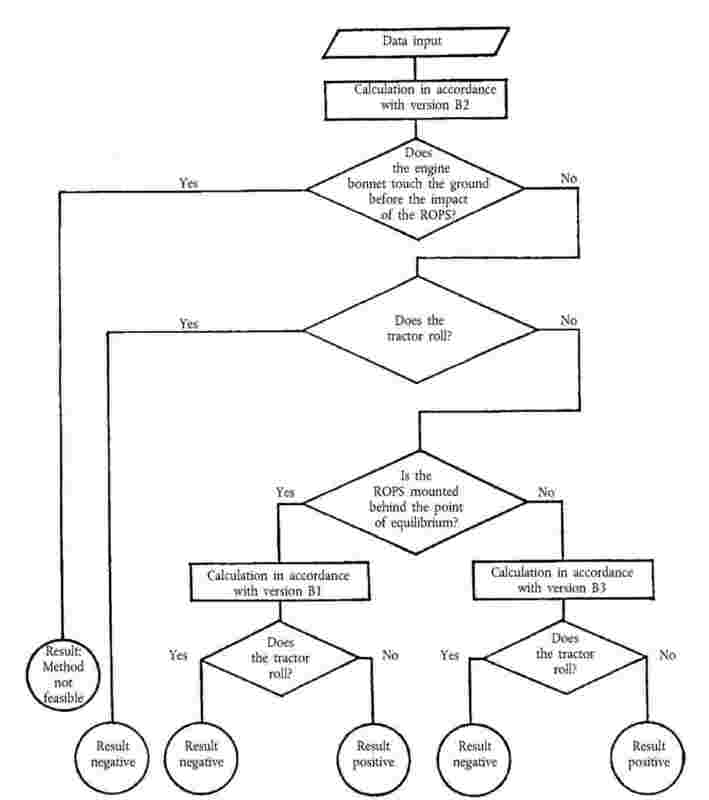 (2) For extension tests to test reports that originally used seat reference point (SRP), the required measurements shall be made with reference to SRP instead of SIP and the use of SRP shall be clearly indicated (see Annex 1). (5) Indicates preferred size. Specimen size shall be no less than largest preferred size that the material permits. (6) The energy requirement at – 20 °C is 2,5 times the value specified for – 30 °C. Other factors affect impact energy strength, i.e. direction of rolling, yield strength, grain orientation and welding. These factors shall be considered when selecting and using steel. 2.5.1. It shall not be possible to start the engine with the PTO engaged. The controls must be laid out in such a way that the operator can actuate them from a safe place. The control(s) shall be designed in a way which avoids unintentional actuation. The start control shall work according to the “hold-to-run principle” for at least the first three seconds of actuation. After actuating the control(s) the time delay to the intended operation shall not be more than the time for the technical engage/disengage system to operate. If this delay time is exceeded, an automatic deactivation of the PTO drive shall occur. It shall always be possible to shut off the PTO(s) from the operator’s seat position as well as from the associated external control(s). The shut off is always an override control. Under symbol 7 insert ‘ISO 3767-2:1991, symbol 7.12 PTO display combined with ISO 3767-1:1991, symbol 7.1 to 7.5 may be used as alternative’. The reference plane is a vertical plane, generally longitudinal to the tractor and passing through the seat index point and the centre of the steering wheel. Normally the reference plane coincides with the longitudinal median plane of the tractor. 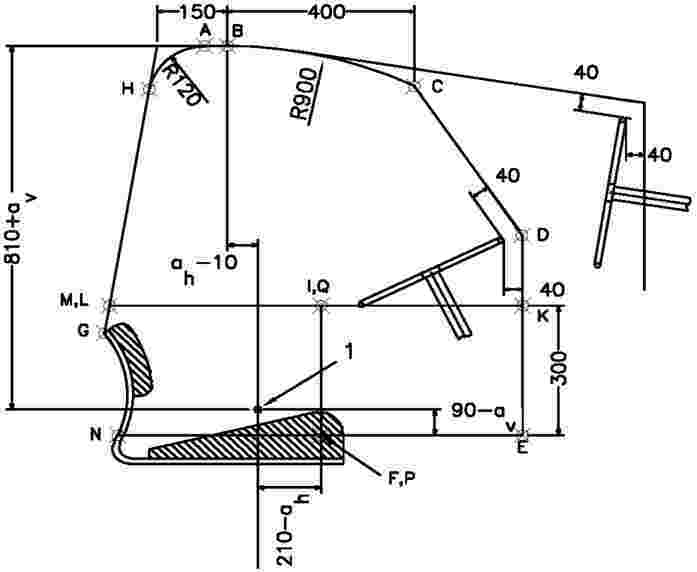 This reference plane shall be assumed to move horizontally with the seat and steering wheel during loading but to remain perpendicular to the tractor or the floor of the roll-over protective structure. The reference line is the line contained in the reference plane that passes through a point located 140 + ah rearward and 90 – av below the seat index point and the first point on the steering wheel rim that it intersects when brought to the horizontal. a surface, curved if necessary, whose generating line is perpendicular to the reference plane and rests on the back of the seat backrest. For tractors with a reversible driver’s position (reversible seat and steering wheel), the clearance zone is the envelope of the two clearance zones defined by the two different positions of the steering wheel and the seat. The protective structure may only be subjected to the strength tests if both the Lateral Stability Test and the Non-Continuous Rolling Test have been satisfactorily completed (see flow diagram as Figure 6.3). The tractor must be equipped with the protective structure in its safety position. The tractor must be fitted with tyres having the greatest diameter indicated by the manufacturer and the smallest cross-section for tyres of that diameter. The tyres must not be liquid-ballasted and must be inflated to the pressure recommended for field work. All the tractor’s tanks must be filled or the liquids must be replaced by an equivalent mass in the corresponding position. All attachments used in the series production shall be fixed to the tractor in the normal position. The tractor, prepared as specified above, is placed on a horizontal plane so that the tractor front-axle pivot point or, in the case of an articulated tractor, the horizontal pivot point between the two axles can move freely. Using a jack or a hoist, tilt the part of the tractor which is rigidly connected to the axle that bears more than 50 percent of the tractor’s weight, while constantly measuring the angle of inclination. This angle must be at least 38° at the moment when the tractor is resting in a state of unstable equilibrium on the wheels touching the ground. Perform the test once with the steering wheel turned to full right lock and once with the steering wheel turned to full left lock. This test is intended to check whether a structure fitted to the tractor for the protection of the driver can satisfactorily prevent continuous roll-over of the tractor in the event of its overturning laterally on a slope with a gradient of 1 in 1,5 (Figure 6.4). Evidence of non-continuous rolling can be provided in accordance with one of the two methods described in 3.1.4.2 and 3.1.4.3. 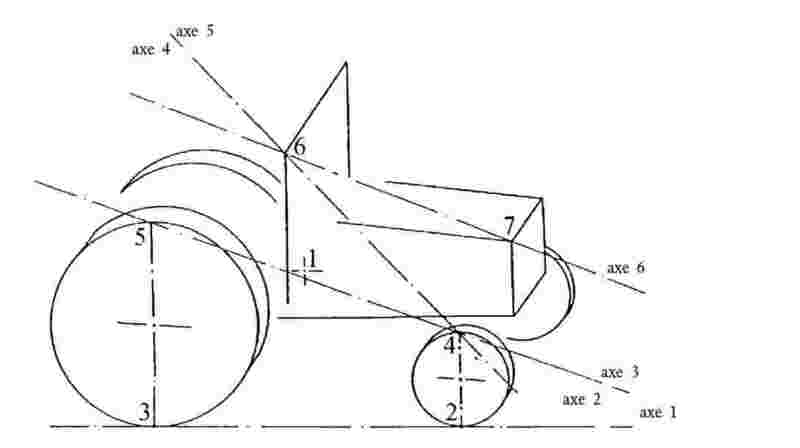 The tractor (prepared as described in paragraph 3.1.2) is tilted laterally with zero initial speed. 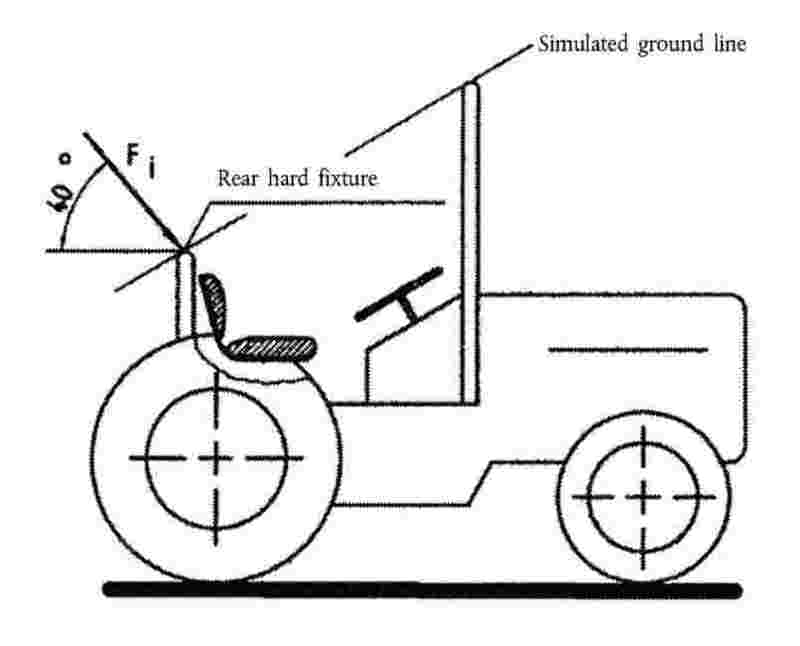 For this purpose, it is placed at the start of the test slope in such a way that the wheels on the downhill side rest on the slope and the tractor’s median plane is parallel with the contour lines. After striking the surface of the test slope, the tractor may lift itself from the surface by pivoting about the upper corner of the protective structure, but it must not roll over. It must fall back on the side which it first struck. The sum of the track (S) and tyre (B0) widths must be greater than the width B6 of the protective structure. no other components of the tractor penetrate into the slope. 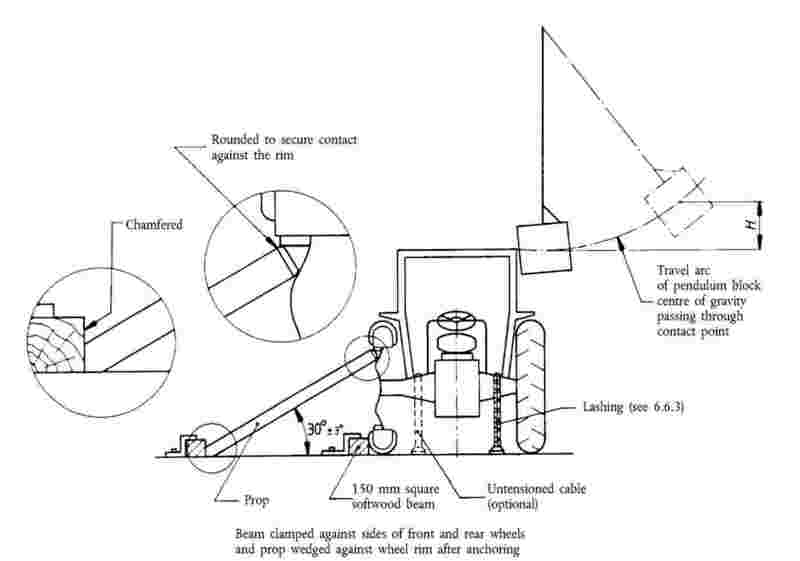 The computer programme (BASIC (5)) for determining the continuous or interrupted roll-over behaviour of a laterally overturning narrow-track tractor with a front-mounted roll-over protective structure is part of the present Code, with examples 6.1 to 6.11. The distance between the rear and front axles on both sides of the tractor shall be measured in order to verify there is no steering angle. 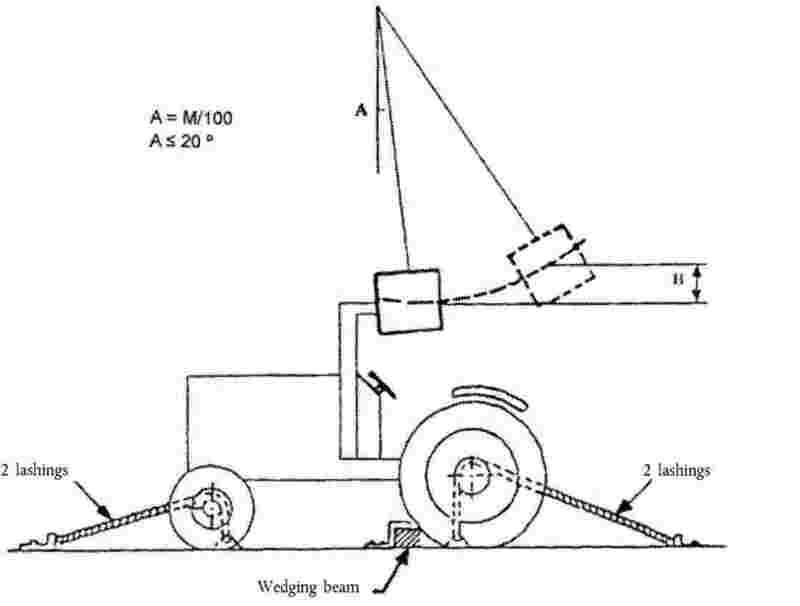 The distances between the centre of gravity and the rear axle (L3) or the front axle (L2) shall be calculated from the mass distribution of the tractor between the rear and the front wheels. The distance from the highest point of the tyre to the ground plane shall be measured (Figure 6.5), and the same method shall be used for the front and rear tyres. The distance between the centre of gravity and the leading point of intersection of the protective structure shall be measured (Figures 6.6.a, 6.6.b and 6.6.c). If the protective structure is in front of the plane of the centre of gravity, the recorded measure will be preceded by a minus sign (–L6). 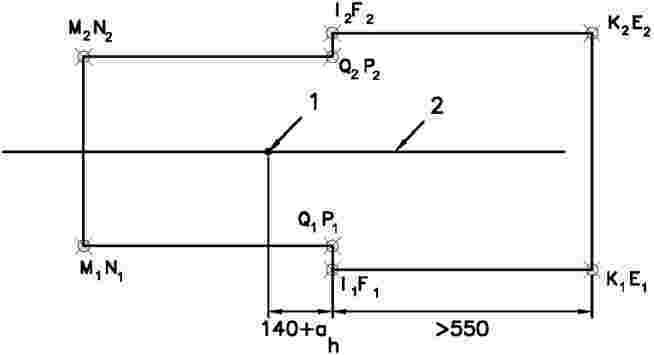 The distance between the right and left points of impact of the two vertical posts of the structure shall be measured. The point of impact is defined by the plane tangent to the protective structure passing through the line made by the top outer points of the front and rear tyres (Figure 6.7). The vertical distance from the point of impact of the structure to the ground plane shall be measured. The vertical distance from the point of impact of the engine bonnet to the ground plane shall be measured. The point of impact is defined by the plane tangent to the engine bonnet and the protective structure passing through the top outer points of the front tyre (Figure 6.7). The measurement shall be made on both sides of the engine bonnet. The distance between the two points of impact of the engine bonnet as defined previously shall be measured. The distance from the point of impact of the engine bonnet, as defined previously, to the centre of gravity shall be measured. 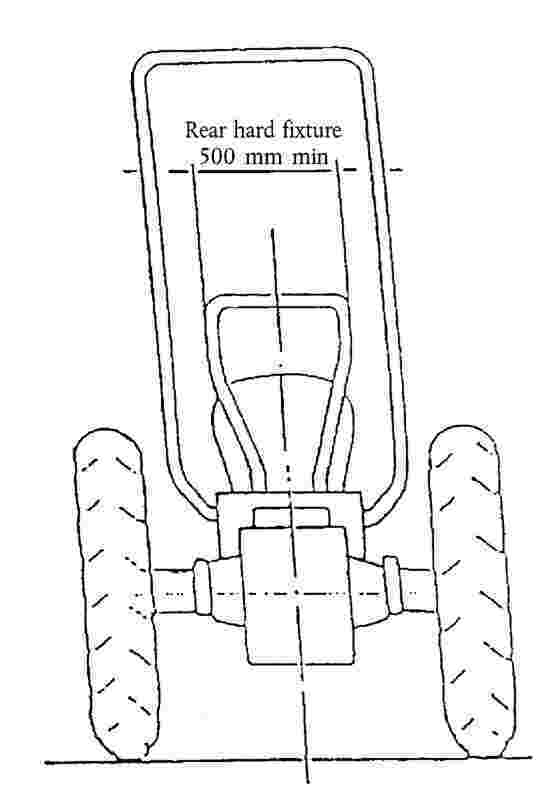 The vertical distance between the centre of the front-axle pivot point to the centre of axle of the front tyres (H01) shall be included in the manufacturer’s technical report and shall be checked. 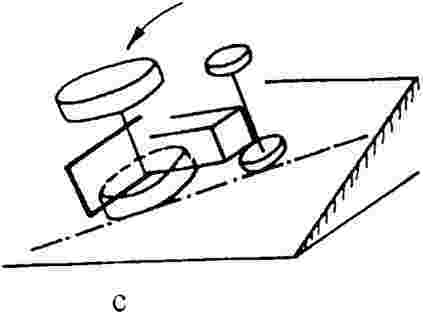 The vertical distance from the centre of the front tyres axle to the ground plane (H02) shall be measured (Figure 6.8). 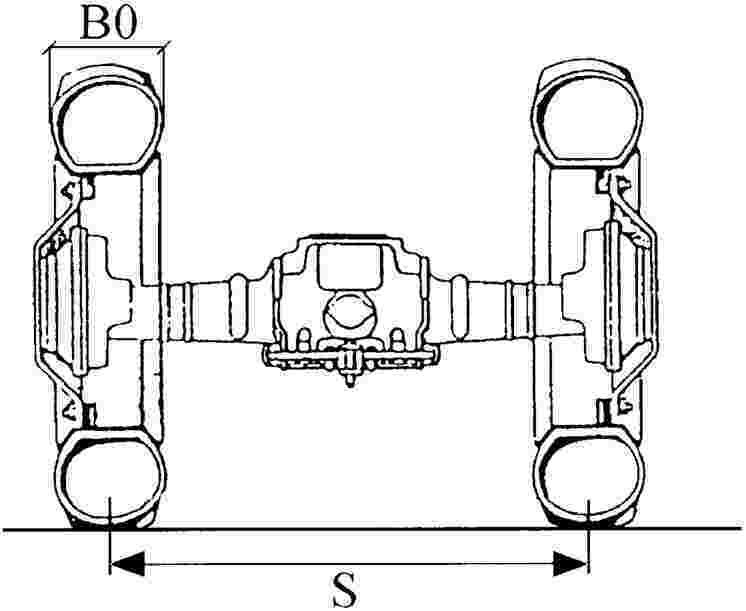 The height of the front-axle pivot (H0) is the sum of both previous values. The minimum rear track width fitted with tyres of the largest size, as specified by the manufacturer, shall be measured (Figure 6.9). The distance between the outer and the inner vertical planes of a rear tyre in its upper part shall be measured (Figure 6.9). The largest angle defined by the swinging of the front axle from the horizontal position to the maximum deflection shall be measured on both sides of the axle, taking into account any end-stroke shock absorber. The maximum angle measured shall be used. The tractor mass shall be determined according to the conditions specified in paragraph 3.2.1.4. Components which may create a hazard in the clearance zone must also be fitted on the tractor (or the assembly) so that they may be examined to see whether the requirements of the Acceptance Conditions in 3.2.3 have been fulfilled. All components of the tractor or the protective structure including weather protective must be supplied or described on drawings. the elastic deflection, measured in accordance with 3.3.1.2.3 and 3.3.2.2.3 shall be less than 250 mm. The mass of the pendulum block must be 2 000 ± 20 kg excluding the mass of the chains or wire ropes which themselves must not exceed 100 kg. The length of the sides of the impact face must be 680 ± 20 mm (see Figure 6.10). The block must be filled in such a way that the position of its centre of gravity is constant and coincides with the geometrical centre of the parallelepiped. 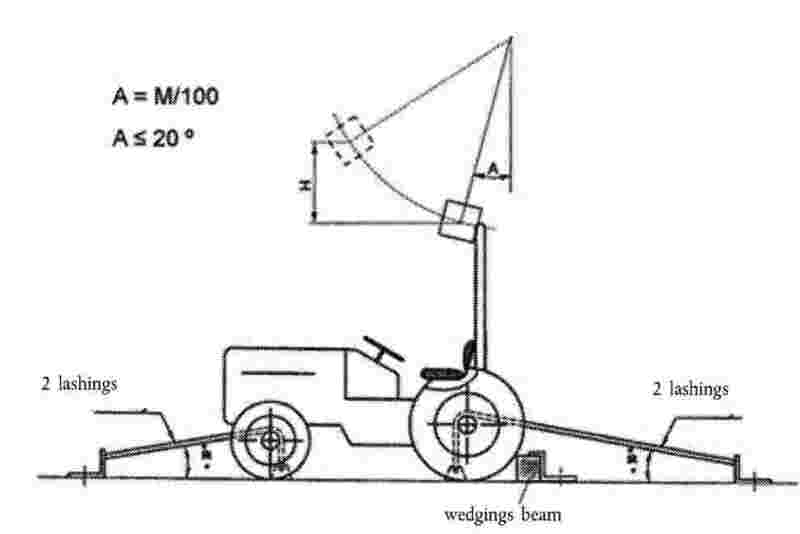 Anchoring rails with the requisite track width and covering the necessary area for lashing the tractor in all the cases illustrated (see Figures 6.11, 6.12 and 6.13) must be rigidly attached to a non-yielding base beneath the pendulum. A softwood beam of 150 mm square shall be used as a prop for the wheels during the impact tests (see Figures 6.11, 6.12 and 6.13). 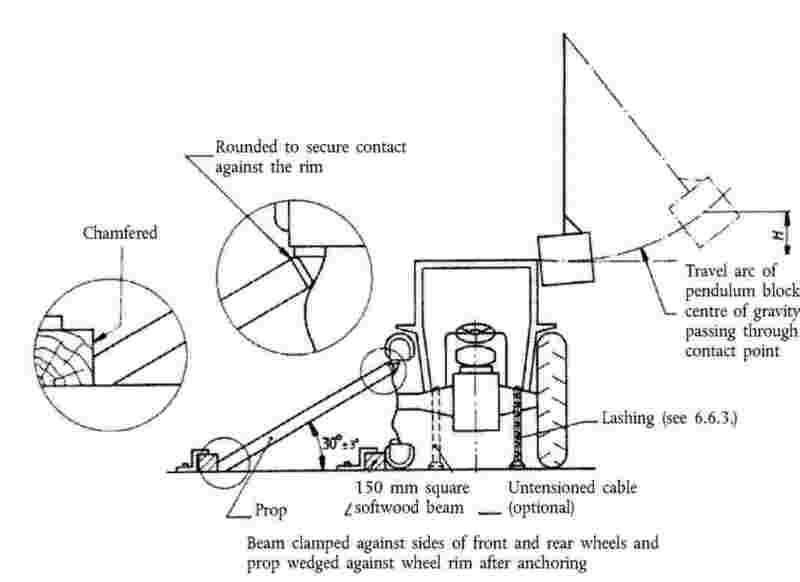 During the lateral impact tests, a softwood beam shall be clamped to the floor to brace the rim of the wheel opposite the side of impact (see Figure 6.13). Additional specific details are given in the section 3.3.1.1 for the impact and crushing tests. 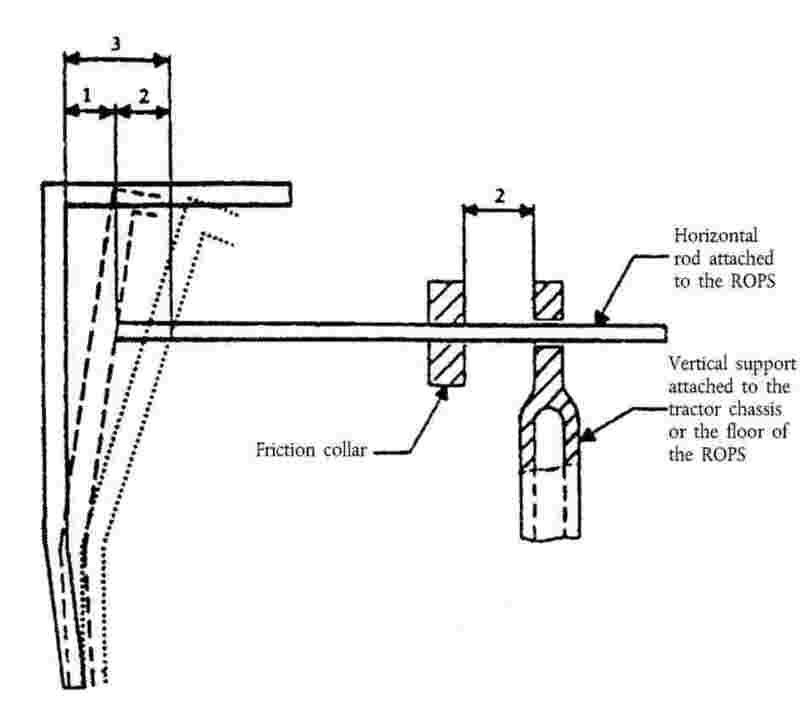 A rig as shown in Figure 6.14 shall be capable of exerting a downward force on a protective structure through a rigid beam approximately 250 mm wide connected to the load-applying mechanism by means of universal joints. Suitable axle stands shall be provided so that the tractor tyres do not bear the crushing force. device for measuring the elastic deflection (the difference between the maximum momentary deflection and the permanent deflection, (see Figure 6.15). device for checking that the protective structure has not entered the clearance zone and that the latter has remained within the structure’s protective during the test (see section 3.3.2.2.2). 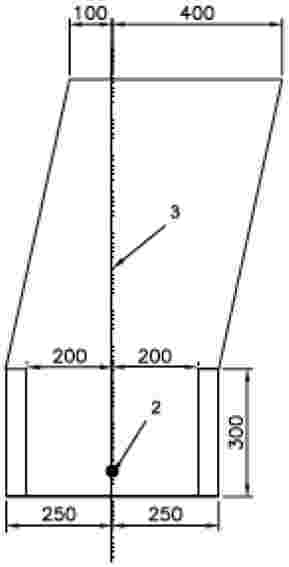 A rig as shown in Figure 6.14 shall be capable of exerting a downward force on a protective structure through a rigid beam approximately 250 mm wide, connected to the load-applying mechanism by means of universal joints. Suitable axle stands must be provided so that the tractor tyres do not bear the crushing force. The tractor must be lashed to the ground by means of four wire ropes, one at each end of both axles, arranged as indicated in Figure 6.11. The spacing between the front and rear lashing points must be such that the wire ropes make an angle of less than 30° with the ground. The rear lashings must in addition be so arranged that the point of convergence of the two wire ropes is located in the vertical plane in which the centre of gravity of the pendulum block travels. The wire ropes must be tensioned so that the tyres undergo the deflections given in 3.2.5.6.2. With the wire ropes tensioned, the wedging beam shall be placed in front of and tight against the rear wheels and then fixed to the ground. For tractors with a reversible driver’s position (reversible seat and steering wheel), the same formulae shall apply. The tractor must be lashed to the ground by means of four wire ropes, one at each end of both axles, arranged as indicated in Figure 6.12. The spacing between the front and rear lashing points must be such that the wire ropes make an angle of less than 30° with the ground. The rear lashings shall in addition be so arranged that the point of convergence of the two wire ropes is located in the vertical plane in which the centre of gravity of the pendulum block travels. The wire ropes must be tensioned so that the tyres undergo the deflections given in 3.2.5.6.2. With the wire ropes tensioned, the wedging beam shall be placed behind and tight against the rear wheels and then fixed to the ground. for tractor with a reference mass of less than 2 000 kg. The point of impact shall be that part of the protective structure likely to hit the ground first in a sideways overturning accident. The tractor wheels on the side which is to receive the impact must be lashed to the ground by means of wire ropes passing over the corresponding ends of the front and rear axles. The wire ropes must be tensioned to produce the tyre deflection values given in 3.2.5.6.2. With the wire ropes tensioned, the wedging beam shall be placed on the ground, pushed tight against the tyres on the side opposite that which is to receive the impact and then fixed to the ground. It may be necessary to use two beams or wedges if the outer sides of the front and rear tyres are not in the same vertical plane. The prop shall then be placed as indicated in Figure 6.13 against the rim of the most heavily loaded wheel opposite to the point of impact, pushed firmly against the rim and then fixed at its base. The length of the prop shall be such that it makes an angle of 30 ± 3° with the ground when in position against the rim. In addition, its thickness shall, if possible, be between 20 and 25 times less than its length and between 2 and 3 times less than its width. The props shall be shaped at both ends as shown in the details on Figure 6.13. 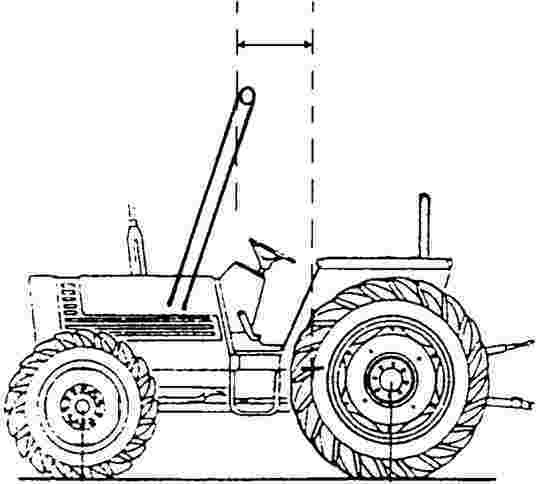 If the tractor is of the articulated type, the point of articulation shall in addition be supported by a wooden block at least 100 mm square and laterally supported by a device similar to the prop pushed against the rear wheel as in 3.3.1.1.3.2. The point of articulation shall then be lashed firmly to the ground. The force Fv shall be maintained for five seconds after cessation of any visually detectable movement of the protective structure. During each test the protective structure shall be examined to see whether any part of it has entered the clearance zone round the driving seat as defined in 1.6.
applied perpendicularly to the top of the frame in the central plane of the tractor. 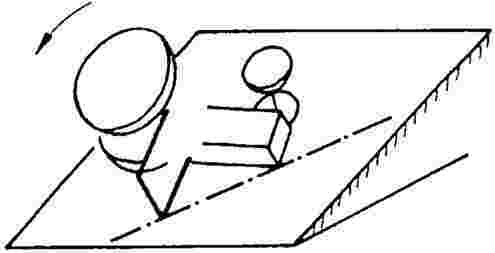 The initial angle of application of force shall be 40° calculated from a parallel to the ground as shown in Figure 6.16. The minimum width of this rigid section shall be 500 mm (see Figure 6.17). In addition, it shall be sufficiently rigid and firmly attached to the rear of the tractor. The elastic deflection is measured (810 + av) mm above the index point, in the vertical plane passing through the point of impact. For this measurement, apparatus similar to that illustrated in Figure 6.15 shall be used. The load shall be applied horizontally in a vertical plane parallel to the tractor’s median plane. The load application point shall be that part of the roll-over protective structure likely to hit the ground first in a rearward overturning accident, normally the upper edge. 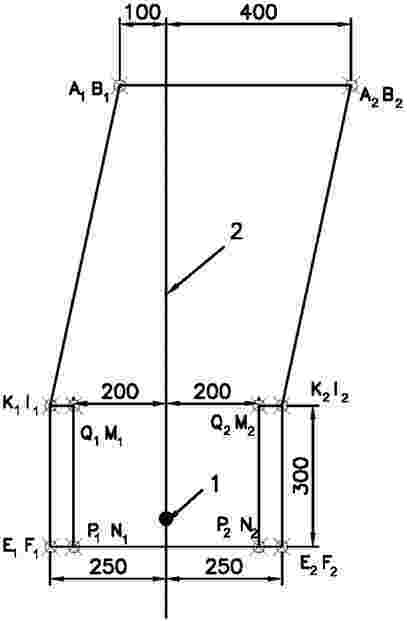 The vertical plane in which the load is applied shall be located at a distance of 1/3 of the external width of the upper part of the structure from the median plane. The assembly shall be lashed to the ground as described in 3.2.6.3. For tractors with a reversible driver’s position (reversible seat and steering wheel), the same formula shall apply. The load shall be applied horizontally, in a vertical plane parallel to the tractor’s median plane and located at a distance of 1/3 of the external width of the upper part of the structure. The load application point shall be that part of the roll-over protective structure likely to hit the ground first if the tractor overturned sideways while travelling forward, normally the upper edge. The side loading shall be applied horizontally, in a vertical plane perpendicular to the tractor’s median plane. The load application point shall be that part of the roll-over protective structure likely to hit the ground first in a sideways overturning accident, normally the upper edge. All provisions are identical to those given in 3.3.1.1.4. All provisions are identical to those given in 3.3.1.1.5. 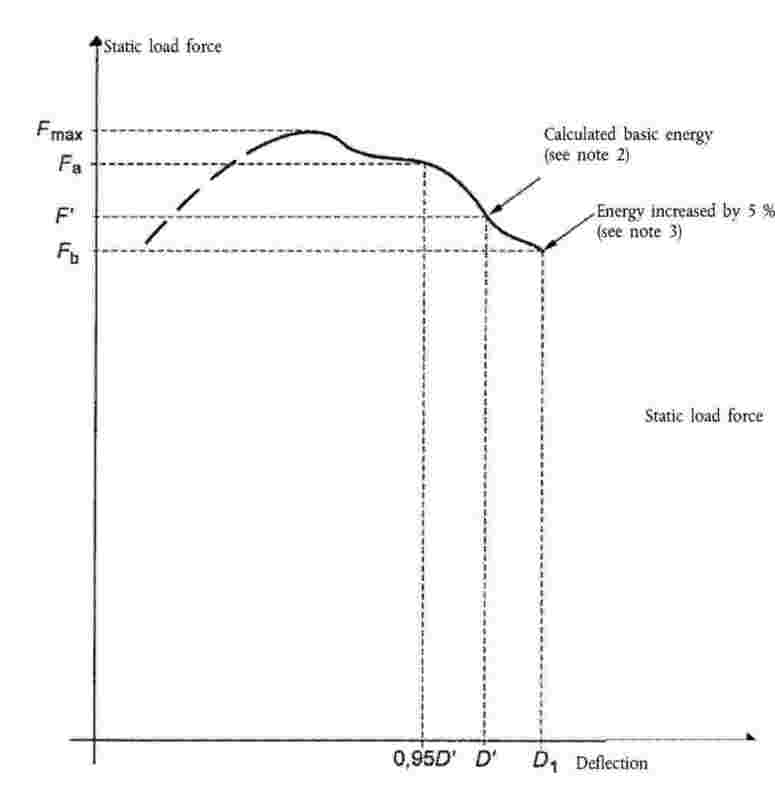 An overload test shall be carried out in all cases where the force decreases by more than 3 per cent during the last 5 per cent of the deflection reached when the energy required is absorbed by the structure (see Figure 6.19). 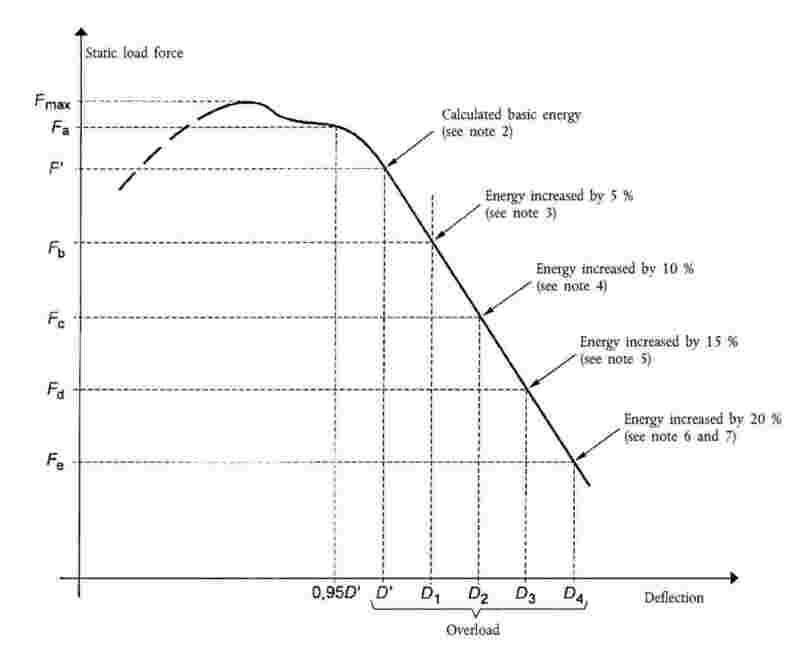 The overload test involves the gradual increase of the horizontal load by increments of 5 per cent of the initial energy requirement up to a maximum of 20 per cent of energy added (see Figure 6.20). During each test the protective structure shall be examined to see whether any part of it has entered the clearance zone as defined in 1.6 in Annex I. The elastic deflection shall be measured (810+av) mm above the seat index point, in the vertical plane in which the load is applied. For this measurement, any apparatus similar to that illustrated in Figure 6.15 shall be used. After the final crushing test the permanent deflection of the protective structure shall be recorded. For this purpose, before the start of the test, the position of the main roll-over protective structure members in relation to the seat index point shall be recorded. The impact or loading and crushing tests need not be carried out on each model of tractor, provided that the protective structure and tractor comply with the conditions referred to hereunder 3.4.2.1.1 to 3.4.2.1.5.
if the force measured when the required energy level has been reached in the various horizontal load tests does not deviate from the force measured when the required energy has been reached in the original test by more than ± 7 % and the deflection measured (6) when the required energy level has been reached in the various horizontal load tests does not deviate from the deflection measured when the required energy has been reached in the original test report by more than ± 7 % (in the case of static tests). more than one protective structure modifications may be included in a single extension report if the represent different options of the same protective structure, but only one validation test can be accepted in a single extension report. The options not tested shall be described in a specific section of the extension report. Increase of the reference mass declared by the manufacturer for a protective structure already tested. If the manufacturer wants to keep the same approval number it is possible to issue an extension report after having carried out a validation test (the limits of ± 7 % specified in 3.4.2.2.2.2 are not applicable in such a case). Modification of the rear hard fixture or addition of a new rear hard fixture. It has to be checked that the clearance zone remains within the protection of the deflected structure throughout all test taking into account the new or modified rear hard fixture. A validation of the rear hard fixture consisting in the test described in 3.3.1.2.2.2 or 3.3.2.2.2.2 has to be carried out and the test results will be drafted in the extension report. 3.6.1 If the protective structure is claimed to have properties resistant to cold weather embrittlement, the manufacturer shall give details that shall be included in the report. 3.6.2 The following requirements and procedures are intended to provide strength and resistance to brittle fracture at reduced temperatures. It is suggested that the following minimum material requirements shall be met in judging the protective structure’s suitability at reduced operating temperatures in those countries requiring this additional operating protection. All welding electrodes used in the fabrication of structural members and mounts shall be compatible with the protective structure material as given in 3.6.2.3 below. Steel materials for structural members of the protective structure shall be of controlled toughness material exhibiting minimum Charpy V-Notch impact energy requirements as shown in Table 6.1. Steel grade and quality shall be specified in accordance with ISO 630:1995. When testing the Charpy V-Notch impact energy requirements, the specimen size shall be no less than the largest of the sizes stated in Table 6.1 that the material will permit. The Charpy V-Notch tests shall be made in accordance with the procedure in ASTM A 370-1979, except for specimen sizes that shall be in accordance with the dimensions given in table 6.1. 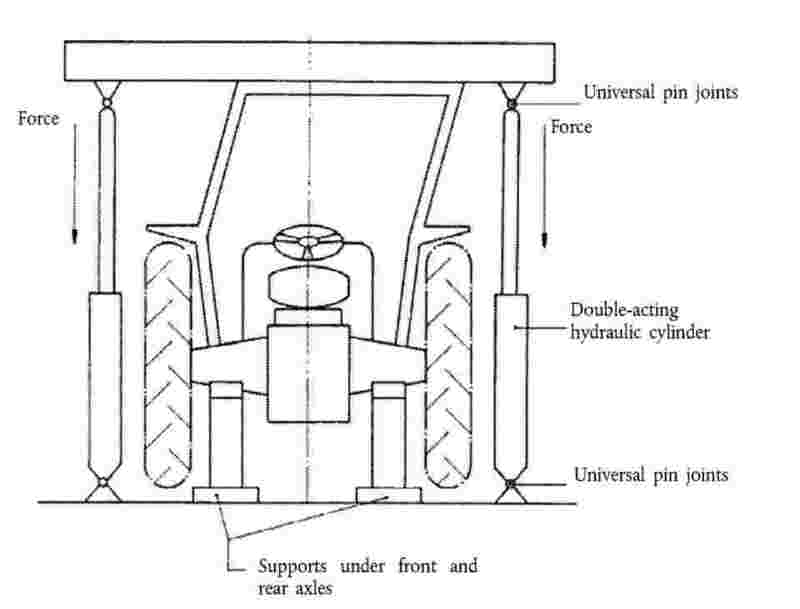 (1) OECD standard code for the official testing of front mounted roll-over protective structures on narrow-track wheeled agricultural and forestry tractors. (4) OECD standard code for the official testing of front mounted roll-over protective structures on narrow-track wheeled agricultural and forestry tractors. (5) The programme and the examples are available on the OECD website. (7) Indicates preferred size. Specimen size shall be no less than largest preferred size that the material permits. (8) The energy requirement at – 20 °C is 2,5 times the value specified for – 30 °C. Other factors affect impact energy strength, i.e. direction of rolling, yield strength, grain orientation and welding. These factors shall be considered when selecting and using steel. In Annex I, Model A, Footnote 15 shall read as follows: ‘Standard ISO 612/-6.8:1978’. Test reports must be in conformity with OECD Council Decision C(2008) 128 of October 2008. The equivalence of the test reports can only be recognised for seat belt anchorages if these have been tested. The test reports in conformity with the Codes following OECD Council Decision C(2000) 59 as last amended by OECD Council Decision C(2005) 1 will remain valid. As from the date of transposition of this Directive, new test reports shall be based on the new version of the Codes.’.